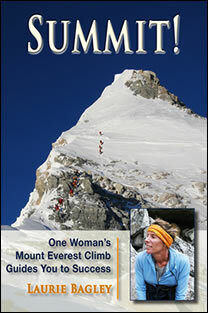 Laurie Bagley has climbed the summits of Everest, Denali, Aconcagua, and Kilimanjaro. She continues to climb part-time, as a guide for Adventures International, while also combining the roles of mother and businesswoman. Her business, Life Journeys, features motivational speaking, goal setting workshops for corporations and colleges, fitness coaching, and her Everest climb documentary. From 1999 to 2004 Laurie raced on a top ten world class adventure racing team. She won the California Outdoor Hall of Fame Award in 2006, and her story has been featured in The Sacramento Bee, San Francisco Chronicle, Her Sports, and Enjoy Magazine. 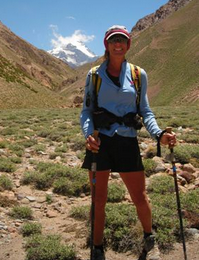 Laurie Bagley holds a Master’s degree in Outdoor Leadership. Drawing on her personal experience, she shows how to set and attain the goals that lie closest to your heart.